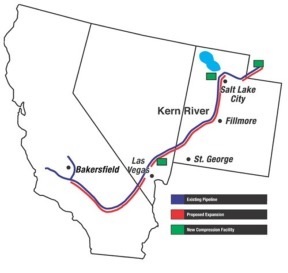 Kern River Gas Transmission Company, a subsidiary of MidAmerican Energy Holdings Company, constructed a $1.2 billion, 717-mile natural gas pipeline from Wyoming to California, doubling the amount of natural gas transported on the Kern River system. The acquisition of permits and entitlements from 47 jurisdictional agencies. We completed our services on schedule and 5% under budget for land and acquisition costs. High Desert Pipeline Project – A lateral pipeline from the Kern River main line to the new High Desert Power Plant. We provided turnkey project management and all real estate, Right of Way, permitting, and notifications for the Project.